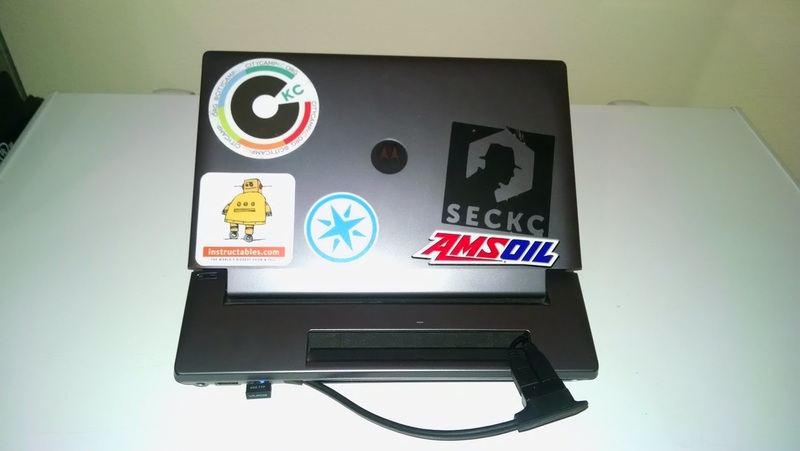 A lot of folks have used the Motorola Lapdock as a portable complement to the Raspberry Pi. It usually ends up as a big mess of cables. My Lapdock was actually used a lot with my last phone, as it was intended to. 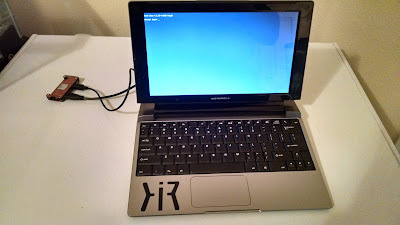 Occasionally, people would ask me if I was using it for a Pi. My response was "If I can figure out how to fit it inside, I'll try." I always figured it would involve de-soldering all the GPIO headers, network and USB jacks to make it thin enough to fit, then a bunch of soldering to hard-wire everything together. With the announcement of the Raspberry Pi Zero, I knew it was finally time. 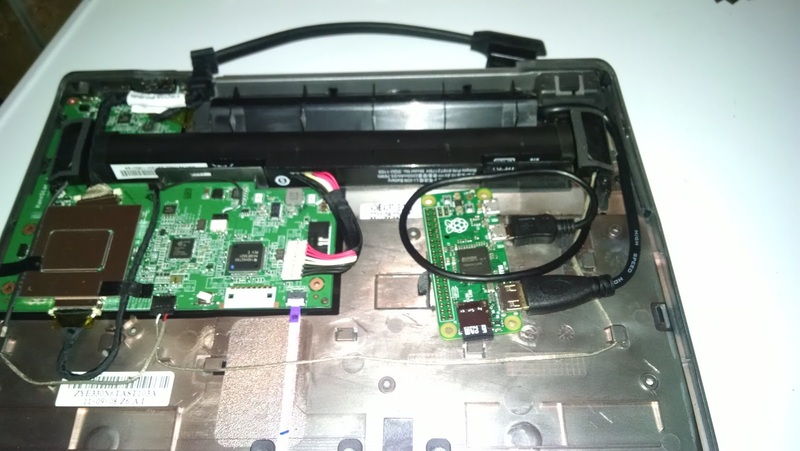 I did a little bit of recon inside the Lapdock case. Plenty of room for a Raspberry Pi Zero and some cables. 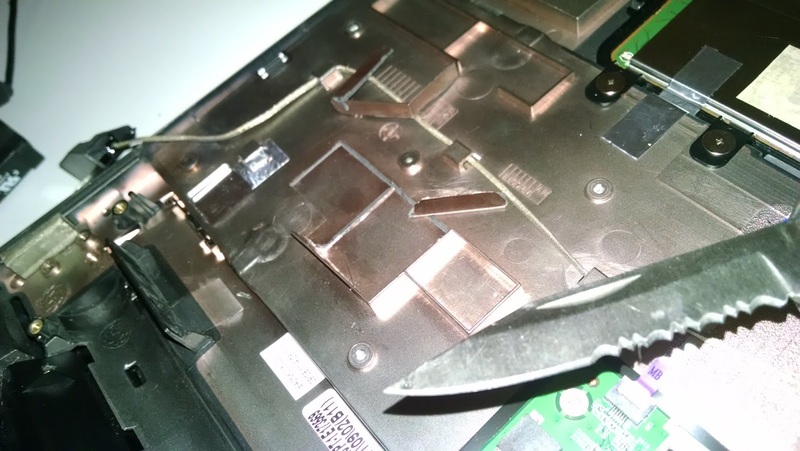 Opening up the LapDock isn't too hard. Start by prying the keyboard loose from the top, with a small flat-blade screwdriver or a spudger. 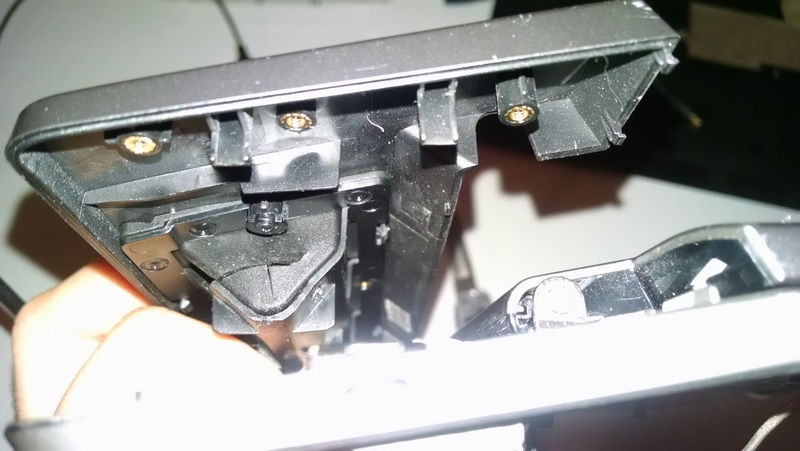 Underneath, you will find a single ribbon cable for the keyboard, and a number of screws. 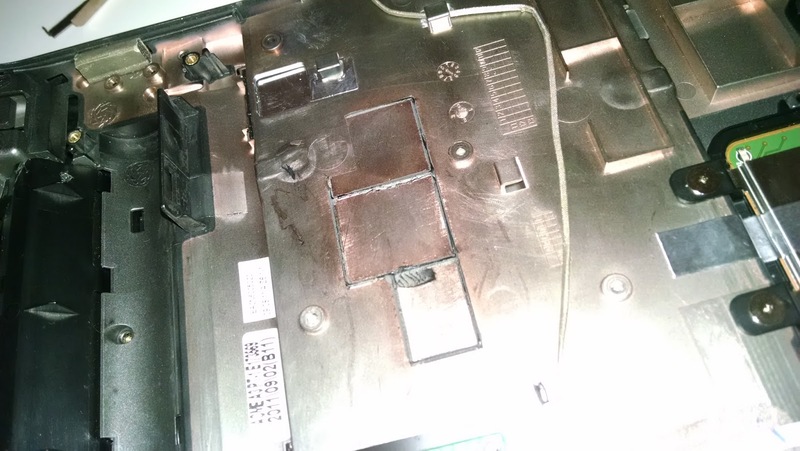 Remove the keyboard and all visible screws. 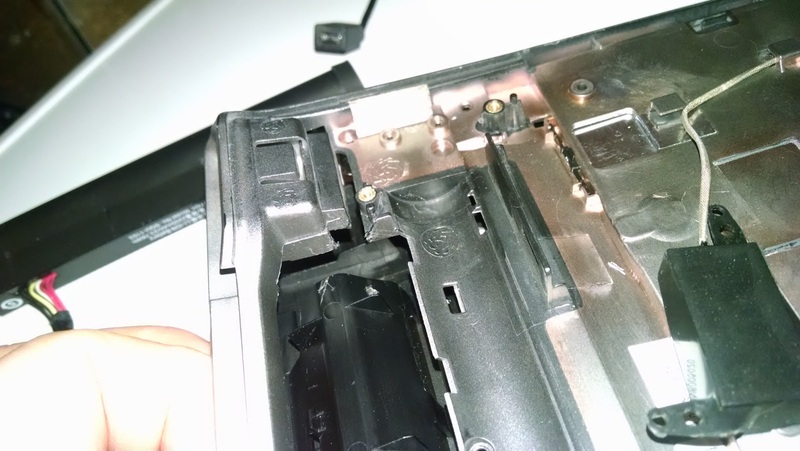 The only thing left holding the case together after that are the four screws on the bottom case, one at each corner. Once I saw the layout inside, my plan was to place some pigtail connectors inside the chamber that the dock connector rests in when not in use. The speaker on the left bottom corner is kind of in the way. I tested everything outside the lapdock first. Miraculously, both cables worked great. I'd read many horror stories of HDMI cables and adapters that didn't work well with the Raspberry Pi. Not bad for 12 bucks. Inside, I got to work. 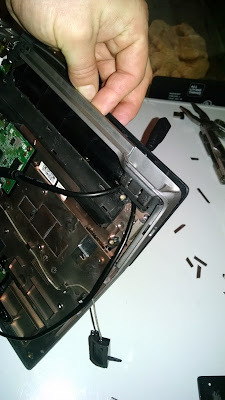 First things first, remove the speaker, held in by two screws. Remove the battery, too. It sits loose in the case and is easily unplugged. At this point, it was obvious to me that I couldn't put the pigtails inside the case where I had planned. There's just not enough room under the speaker. I took the top case apart a little further by removing the screws marked below. I cut away a little piece of plastic under the speaker to open up some space near where the dock cable rests. 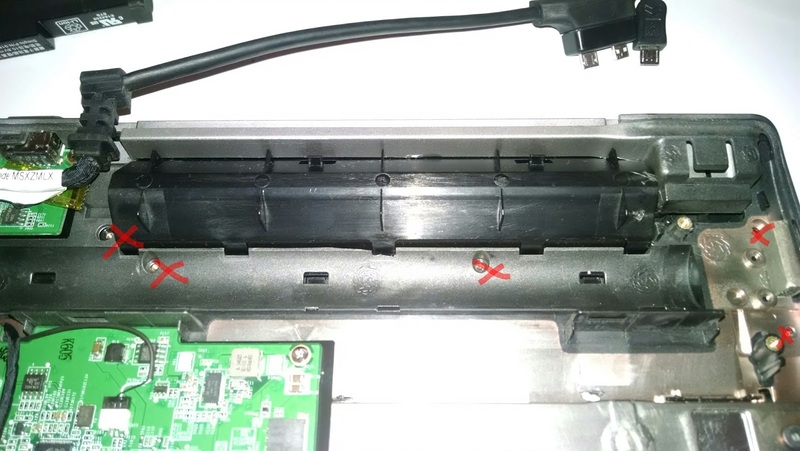 Then, I pried apart the upper part of the dock on one side, giving me enough room to make a cross-shaped hole in the rubber dock membrane by making two slices with a knife. I'll have to run the pigtails through this corner of the phone dock. I routed the cables through the maze of plastic and shoved them through this hole. 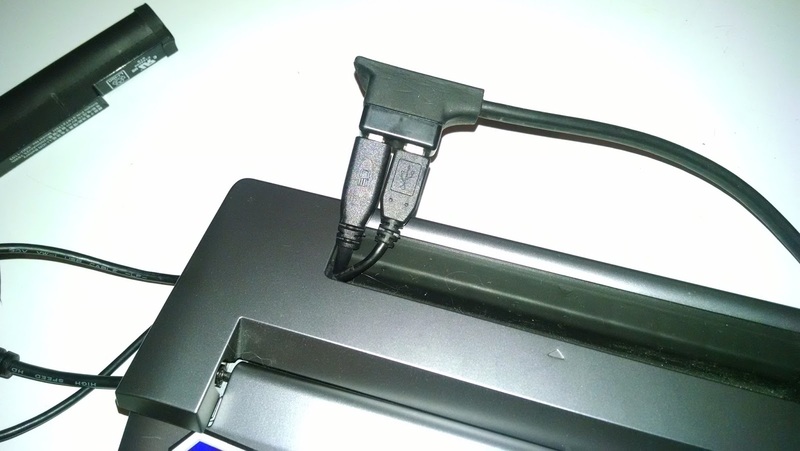 I had to make sure the plugs were oriented properly for a good fit with the dock connector. To make room for the Pi, I took a knife blade to some of the plastic structures inside the case. A tab (not shown) on the lower case lid also needed to be trimmed. The final part before reassembly was trying to find a good way to route the cables so that the Lapdock could be reassembled nicely. I held the Raspberry Pi Zero down with some double-sided foam mounting tape once I had everything in position. 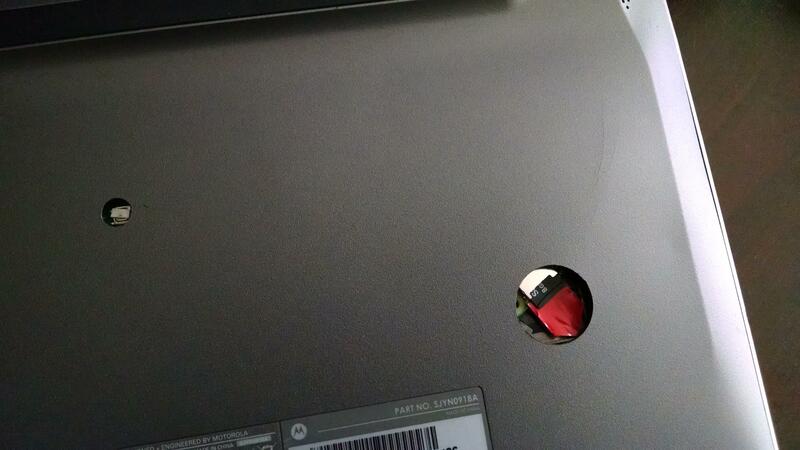 This tape also insulates Pi from the metallic coating on the inside of the Lapdock's case, so don't skimp on it. Once everything was buttoned back up, I plugged the dock connector into the pigtails again and powered the dock up. The end result is a nice, self-contained computer powered by the Raspberry Pi Zero, but the dock is still usable for other devices. 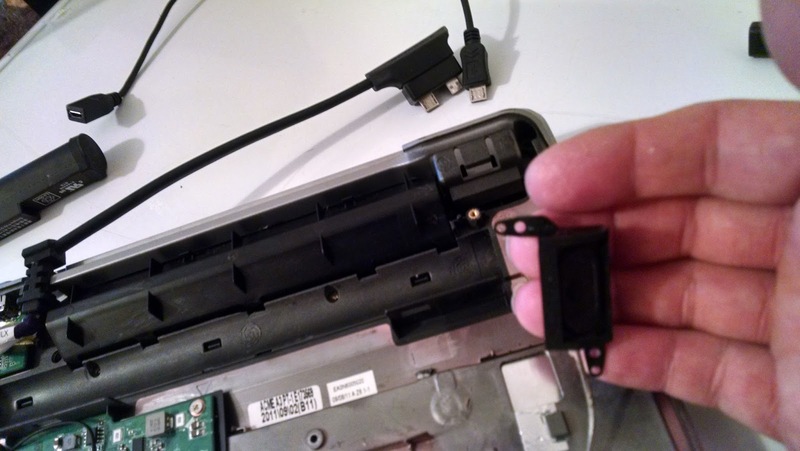 Frequently, you have to use the reset button on the bottom of the lapdock to get it to boot proplerly, and I wanted to be able to reset the dock with my pinkie finger. Also, I wanted a way to easily swap out MicroSD cards. To fix these two issues, I used a stepped drill bit to enlarge the reset pinhole and to give me access to the Pi Zero's card slot. No more "Hacky GNU Year"